Europe-based Colep and the UAE-based Scitra, part of the Albatha Group, have formed a joint venture to create an aerosol contract manufacturing operation in the UAE. 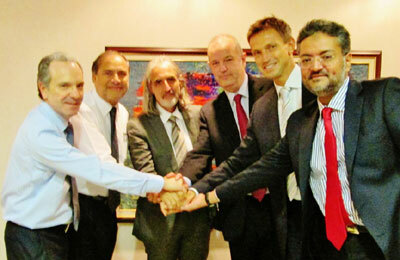 The Joint Venture will operate under the name of Colep Scitra Aerosols. Colep, a RAR Group company is a global leader in the consumer goods packaging and contract manufacturing industries. With a turnover of 543 million euros in 2012, Colep employs around 3,600 people in Portugal, Brazil, Germany, Poland, Spain, Mexico and the UK. Both the companies will invest in the expansion and improvement of the existing Scitra aerosol filling plant in Sharjah, aligning it with international standards required by multi-national brands within the personal care and home care industries, a statement said. The parties will bring their respective expertise and knowledge of the regional and international markets to the new venture. This JV will thus create a first class operation that will serve the Pafta (Pan Arab Free Trade Area) and Comsea (Common Market for Eastern and Southern Africa) countries of the Middle East and Africa, it said.